SOAR new student leaders welcoming incoming students with a rendition of “Varsity.” Photo Courtesy of Jeff Miller. The local airport and surrounding streets flood with traffic as incoming freshmen and transfer students travel to campus from all over the world for the two-day Student Orientation and Registration (SOAR). 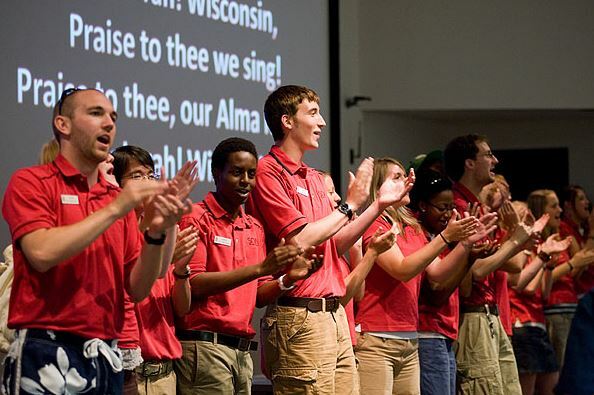 SOAR is more than picking classes and meeting your advisor, it is the beginning of your Wisconsin Experience. “We create a welcoming atmosphere that lets students know they are ready to begin an incredible journey, a new chapter in their lives,” Center for First-Year Experience Intern Adam Piasecki said. SOAR has been held for new students in Union South since before the reopening in 2011. With a range of dining options, a location in the heart of campus and help from Union staff, Union South has become a cornerstone of the SOAR program. During any free time students and families may have, they are encouraged to walk around around campus and start to see themselves as a part of the UW-Madison community. Scheduled SOAR programming across the two days includes meals, presentations, discussions groups and academic advising. Also on students’ check-list is to get their Wiscard, the official UW-Madison identification card. A Wiscard gives access to libraries, recreation facilities, door access to residential halls and a money source for the unions, bookstore and dining halls. Wiscard, run by the Wisconsin Union, also has a program with UW Credit Union that gives you to option to use your Wiscard as a PIN-based debit card with a UW Credit Union checking account. This means you can use your Wiscard at any ATM or business that accepts PIN-based debit transactions. Wiscards are students’ key to UW-Madison, and when leaving campus with a class schedule and their card, many incoming students become excited to return in August. “[Your Wiscard] is a physical sign that you are a Badger and nothing is cooler and more exciting than that,” Adam said. Since all SOAR programming is held in Union South, Union staff play an integral part in helping organize events, catering and tie loose ends along the way. Adam describes his experience of planning SOAR as rewarding, as he plays an integral part in affecting people in a positive manner. Gabrielle DiBenedetto is a UW-Madison junior double majoring in Journalism and Economics. She can be seen studying or chatting with friends in the Sun Garden at Union South with a bowl of Babcock ice cream. Our goal is to share the stories of lifetime connections, traditions, innovation and experiences at the Wisconsin Union.